The goal of this experiment is to show how to determine a surface tension of a liquid by dripping. Surface of a liquid behaves like a thin flexible membrane that tries to achieve an equilibrium state (state with minimum energy). With increasing surface, the energy of the surface layer increases. The surface of the liquid hence tries to take the smallest and smoothest area. The value of surface tension decreases with increasing temperature. One of the methods to measure surface tension of a liquid is to let the liquid drip. Liquid in a capillary tube forms drops at the bottom of the tube. The drops will gradually grow and, when they reach a sufficient size, they will separate from the liquid. where σ is the surface tension of the liquid, l is the circumference of the drop dripping from the capillary and d its diameter. Using this formula, it would be possible to determine the surface tension. 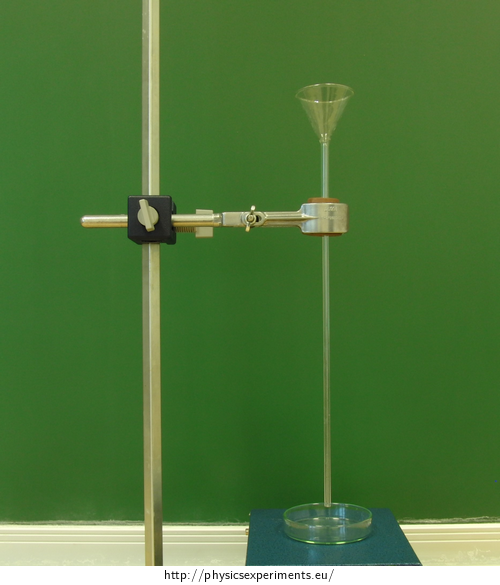 The accuracy of this measurement is negatively affected by the fact that only a part of the drop is separated from the tube when the drop drips; part of it stays on the end of the capillary. Before separating, the drop is narrowed and its diameter is smaller than d. Therefore, the dripping method is used mainly as a reference method. If we work with the same capillary, the diameter of the narrowed drop is approximately the same with all wetting liquids. You can find the solved task here: Oil Pipetting. Note: If you do not have these tools, you can use a capillary or pipette to drip the liquid (see Technical notes). Insert the funnel in one side of the hole in the cork and the capillary in the other. 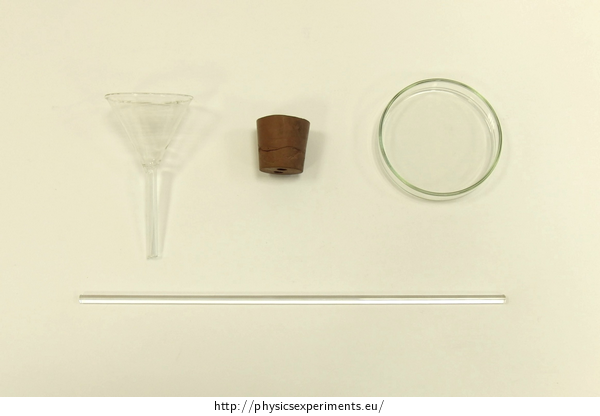 Fasten the cork in the laboratory stand. Weigh the empty container which you later use to catch the drops. Measure the temperature of both liquids. Pour the liquid in the funnel. Drip 100 drops (if we want to measure more accurately, we can drip more drops). Weigh the container with 100 drops. Determine the mass of 100 drops and then the mass of one drop. Use the same procedure to determine the mass of one drop of water (second liquid). We made the measurements with water, alcohol and kerosene. We weighed the container and let all the liquids drip into it. The temperature of both liquids was 20 °C. We used water as the reference liquid with known surface tension (σ1 = 72.75·10−3 N/m at temperature 20 °C). Table 1 summarizes the mass of 100 drops of each liquid m100, the mass of one drop of each liquid m1 and the surface tension σ. We can use a pipette or a capillary to perform this experiment. Draw the measured liquid into the pipette or the capillary, block the upper end with your finger and let the liquid drip. We can influence the drip rate by pushing the top of the pipette.